With the launch of our new Business subscription, sharing ADS-B data with Flightradar24 has never been more rewarding. We have also made setting up your receiver as easy as possible so you can quickly begin sharing data and enjoying your new subscription. If you’re looking for a quick and fun project, you can build your own receiver based on a Raspberry Pi. We have a list of required parts and links to vendors as well as detailed instructions explaining how to set up your receiver available in the Add Coverage section of our website. 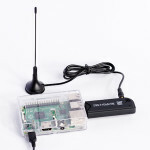 The basic components include a Raspberry Pi (any Raspberry Pi will do) and power supply, a DVB-T USB stick, an antenna, a 1 GB MicroSD card (on which to load our Pi24 software), and an ethernet cable to connect to the internet. Once you have your components, you’ll use your computer to load our Pi24 software onto your MicroSD card and into your Raspberry Pi. Once you’ve connected you components together, we make activating your receiver simple too. From a computer or mobile device on the same network as your receiver, all you need to do is click on a link to register your receiver and begin sharing data with Flightradar24. Once our network confirms your receiver is sharing data, you’ll receive an email with instructions on how to activate your Business subscription. If you already have an ADS-B receiver running on a Raspberry Pi, Linux, Mac, or Windows computer we also have software that enables you to share data with Flightradar24. Visit our Share Your Data page to download the latest version of sharing software and find directions for installation. See our introductory post to read more about these features and others included in a Business subscription. If you want to see how your coverage compares with other data sharers, head to our Share Statistics page. Once there, you can sort by top radars or top users. You can also update your sharer name that appears in the leaderboard. Want to move up the leaderboard? Check out our guidelines for antenna positioning to get the most out of your receiver. If you have any questions or need assistance setting up your receiver, our support team is always happy to assist.